Top 10 Stress-Busting Activities Close to D.C.
Are you feeling down by the daily grind? If you need to escape the stress of daily life in D.C., you're in luck. We've compiled a top 10 list of some great opportunities to let off steam, all situated within easy access of D.C.
1. 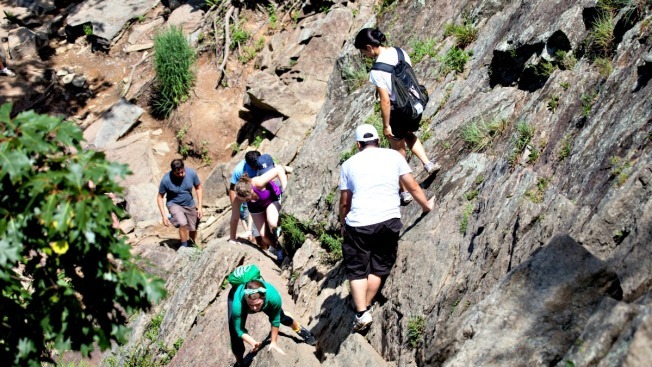 Hike the Billy Goat Trail at Great Falls Park, Md. A fairly strenuous but beautiful half-day hike, situated in Great Falls Park (the Maryland side). The park is only about a half hour's drive from the city. There are three trails available: A, B and C. The latter offers a gentle route while A and B offer more exciting trails with some rock scrambles and a little climbing. Start at the Great Falls Tavern Visitor Center. Why will it bust stress? Arrive before noon to beat the crowds. Pack water and snacks and take the trails slowly to really enjoy the peaceful surroundings. 2. Jog the Swamp Trail on Roosevelt Island in D.C.
You might have heard people refer to D.C. as a swamp in the humid months, but on Roosevelt Island this seems even truer. The island is in the center of the Potomac River and was built as a monument to Theodore Roosevelt on the 1930s. It's actually comprised of forest and swamp land that was designed by architects to resemble the overgrown island that once stood in that spot. Exercise is a great stress-buster and this trail feels surprisingly isolated, despite being a stone's throw from both Rosslyn and D.C. Entry is free and the island is accessible by footbridge close to the Rosslyn metro station, so there's no need to drive. Park Rangers offer tours that bring the island's secrets to light. 3.Visit the GoApe ropes course in Rockville, Md. A "treetop adventure course" with zip lines, rope courses, swings and trails through the forest canopy. You'll be strapped into a harness and allowed to traverse 6 distinct sections by yourself, at your own pace, with qualified staff on hand at intervals to keep you safe and secure. This one is a little pricey, with tickets at $55 for adults and $35 for kids, but it's a unique experience. The adrenaline should wash away the cares of the week and there's plenty of fun to be had too. Book in advance and wear old, comfortable clothes (you may get a little dirty). In the heat, escaping underground is a welcome relief but in Virginia's many caverns there's also a lot of natural beauty to enjoy. There are four cavern systems about an hour's drive from D.C. including Luray Caverns, Shenandoah Caverns, Endless Caverns and Skyline Caverns. There's nothing like grandiose natural sights to make human worries seem smaller. The caverns can be toured with guides or at your own pace and they offer peaceful contemplation on quiet days. Escape the world you know, and all of the problems in it, for a few hours. Luray Caverns is the most famous, and the largest, of the attractions. It offers more of a tourist trap though and is the most expensive. Consider the handful of options for the one that is right for you. 5. Explore the Great Dismal Swamp in Suffolk, Va. In southern Virginia, the Great Dismal Swamp National Wildlife Refuge is a huge patch of protected land that also includes Virginia's largest natural lake, Lake Drummond. The swamp is full of birds, fish and mammals to spot and trails to hike or bike, and it's free to visit. This is a bit more of a drive from the city, but it offers incredible beauty and a real change of scene. Biking and hiking through the quiet marshland is a great way to catch your breath and forget the world for a few hours. The Great Dismal Swamp is a great location for fishing, hunting and bird watching. 6. Go tubing at Harpers Ferry, Va.
Harpers Ferry National Historic Park is a living historic community and a beautiful slice of nostalgia. You can tour shops and museums but also offers a great spot for tubing on either the Shenandoah or Potomac rivers. Floating the day away on an inner tube with a drink in hand is about as relaxing as it gets. But there are also options for more exciting white-water tubing and rafting. There are plenty of options available from outdoor adventurecompanies if you need to rent equipment. Wear sun screen and sunglasses and bring some stressed-out friends and a small cooler of your favorite drinks to put in a "cooler tube" (be aware that operating a tube under the influence of alcohol is illegal though). 7. Enjoy a break in Rehoboth Beach, De. Ocean City in Maryland might be the beach destination to which D.C.'s families are most drawn, but Rehoboth Beach in Delaware offers a quainter alternative. Aside from the big holiday weekends, it can be a little quieter than either Ocean City or Virginia Beach but offers all the same amenities. The beach is huge and the boardwalk provides all the expected fun and games -- but it's the city itself that's the real gem. Full of cozy charm, it's quiet enough to be relaxing but still offers plenty to do. Take advantage of some of the upscale dining, farmers' markets and local crafts to really unwind. Try booking a vacation rental instead of a hotel for a chilled-out weekend with some friends. A large theme park in Maryland that is often overlooked thanks to its proximity to both King's Dominion and Busch Gardens Virginia. Six Flags America doesn't have as many coasters as the former or the sprawling grandeur of the latter, but it is the only major amusement park accessible by metro from D.C. It also offers a free water park (included in theme park admission). Do you ever just need to scream? Here's the place to do it. The park has added two new coasters in the last three seasons, Apocalypse and Ragin' Cajun, and has taken steps to revamp the themeing and landscaping park-wide in recent years. If you're familiar with the other area parks, try leaving the car at home and give Six Flags a try. Bring swimwear, as the water park is a big addition to your day. Superman: Ride of Steel attracts long lines so try to hit that during meal times or show times. An area of the eastern shore of the Chesapeake Bay that juts out into the water and offers old-fashioned good times. We recently covered a seafood festival on Tilghman Island, but there's plenty of chances to get some great crab, shrimp and fish in the restaurants on the island. This could make a peaceful detox destination with a choice of luxury or modest accommodations. Keep an eye on events for an extra special trip. 10. Take a kayak down the Potomac River in D.C.
A gentle option to get out on the water without having to stray far from the city. You can choose from options at the Key Bridge, near to Nationals Park or the National Harbor. This trip requires very little planning and kayak rental is available for about $15 an hour. You could take classes and enjoy learning something new, or simply go out on your own for an hour of peaceful exercise. Take (or rent) a bicycle from the city, through Rock Creek Park down to the waterfront for a whole day of outdoor fun.